This week, we have the pleasure of offering you a chance to own some truly amazing items. The Dominican Sisters of SIENA CENTER have asked ATR to liquidate thousands of items that are no longer in use at the convent. 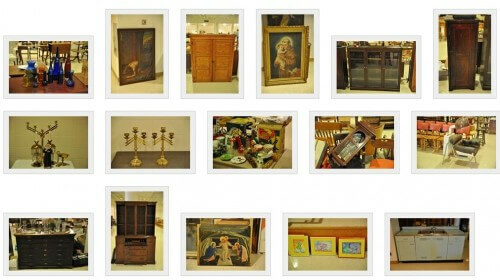 Liquidation of amazing collectibles that have been stored for many years. Amazing Religious collectibles- Reliquaries, Host Makers, Fonts, Kneelers, Candlesticks, Rosaries, Books, Statuary, Artwork, and more. Incredible collection of paintings, drawings, prints, photographs, sculptures, and posters. Oil paintings dating to the early 1800s, modern art pieces, local artists works, listed artists, and plenty of great pieces done by some of the sisters over the past 150 years. Jewelry & Coins – A handful of gold and sterling watches, sterling thimbles, assorted jewelry pieces (mostly costume), Sterling Coins, Vatican Coin Set, as well as some ancient Roman coins. Stamp Collection- One of the sisters was an avid stamp collector, and there are numerous stamp albums loaded with stamps. Glass & Collectibles- Gorgeous Cut Crystal Pieces, depression glass, Limoge, china, vases, etc. Mid Century Furniture- This sale has the largest collection of Thonet Chairs we have seen. 5 Different Styles of Thonet chairs, as well as a Thonet ottoman. Danish furniture, as well as other retro pieces mixed in. Pam notes: The chairs look fantastic! I spy what might be George Nelson for Steelcase office drawer units, too? Retro Kitchen! !- We have a full Turquoise (aqua) kitchen. Including sink, countertops, and cabinets. This is amazing for any retro renovation! Pam notes: That’s a St. Charles kitchen – yum. Antique Furniture- We have dozens of tables, from 12 foot harvest tables, to small parlor tables. Doctor’s Cabinets, Plant Stands, China Cabinets, Jelly Cupboards, Vestment Chests, Shelves, Cabinets, Built-ins, dormitory desks, and loads of chairs!! Books- Antique religious books, newer best sellers, cookbooks, children’s books, and hundreds of books of sheet music. Musical Instruments-Vintage accordion, as well as a number of organs. Assorted Other Goodies- Pottery Wheels, Linens, Christmas and Holiday Items, Kitchenware, Luggage, Videos and Cassettes, Office Supplies, and more! This will be an extremely fun sale, and a chance to purchase items that are rarely available to the public. UPDATE: Kate went to the estate sale — see her follow up story here. What amazing finds! I mapped to see how far it was from the twin cities..6 hours. too bad! Hmmmm….a 5 hr drive for me, but we’re moving if our house ever sells (a mid-century multi level in Iowa for anyone interested) and I don’t know if it’s wise to buy more furniture. The hubby was just in that area yesterday – not sure I could talk him into a return trip!! Would love to go though! Oh boy, do I miss junqueing from when I lived in WI ! I’m sitting her in CA looking right now at a gorgeous oak cabinet I bought from one of those convent sales….for, I think, $35! Best find I saw come out of one of those WI convents was the jadeite fire-king tableware………..they had enough for biiig church suppers. My friend got 8 fullllllll settings for around $100 if I remember. I doesn’t get better than those WI convent sales…sigh. If anyone gets to go, share some pix! Thank you so much for posting this!! We drove up from Illinois and snagged 4 of these amazing chairs this morning! I couldn’t be more in love with them! How were the prices? I’m over in Madison and trying to decide if it would be worth the trip tomorrow. Prices were not exactly a bargain. Expect to pay fair market value. Honestly I wouldn’t bother making the trip on Saturday. It was so picked by mid day Friday I’d be surprised if there was anything good left. That is what I was thinking. I found more pictures at the estate companie’s website and except for the chairs and the kitchen setup I didn’t see a lot I would be interested in. I assumed the chairs would either all be gone or at least well picked over. I made the mistake on Friday of running up to Appleton for a 50’s estate sale. What a waste of time and prices were ridiculously high. At least I stumbled upon a nice barn sale and picked up some nice mid-century lamps on the way home (and just when I thought I was over my lamp addiction). Thanks for the verification of what I was thinking.